Grill a Christian: Question 1. Why did God make us? Question: Why did God create us, and does the answer ‘so we might glorify and love him,’ mean God is selfish? God created us because he is, by nature, a creator of life. I believe the catechism answer is true, but a little limited, because it focuses on our response not on God’s free action in creating. I think it’s wrong to think of God as creating us outside himself for the purpose of having little minions who worship him. We exist ‘within’ God’s infinite being, and he gives us life and breath, and being, and love. In one sense, this question is like asking why Shakespeare wrote the characters he created into existence. How could he not when he had such magnificent stories to tell. How much more must God be compelled to create when he wanted to create the Gospel story (Revelation talks about the lamb slain before the creation of the world — the Gospel was always God’s plan). Let’s assume that God is love. Like the Bible says. That he acts, makes, and creates, out of love. This love is directed, at first, within the Trinity, but it pours out from that. Creation is an act of love, an act of love overflowing — creating more things for the infinite/eternal triune God to direct his infinite love towards. It’s also, if Colossians 1 is a good summary, a gift from Father to Son, an inheritance, which, because God’s love is an overflowing or abundant love, overflows to those parts of his creation redeemed by Jesus, and united in the love of God. Creation is also an act of the Son, the ‘word’ who was with God in the beginning as God spoke the beginning, and the cosmos, into existence. Creation is not an act by which God the Father glorifies himself, but by which God the Father glorifies and celebrates the Son, and by which God the Son glorifies and shows his love for the father, and by which the Holy Spirit glues both together. Creation is a Trinitarian love story, and an outpouring of that to us. So when Jesus prays that we might share in the love of the father and son we’re being brought into this eternal, infinite love story not just as spectators to God’s ‘cosmic love story’ but as actors in it. With parts to play as we celebrate and experience the overflowing of this love… Here’s a thing Jesus prays about us which is incredibly profound — that we might share in the unity of the Trinity, becoming one as they are one. God’s creative act is generous and other-seeking, and inclusive, rather than self-seeking. It is also measured in that it never forces this conclusion — this drawing together — on anybody who doesn’t want it. Also, because God is not a ‘self’ in an individualistic sense, but is found in the perfect interwoven, overlapping nature of the Trinity (there’s a Greek word that captures this best ‘perichoresis’, which means interpenetrating), the pursuit of glorification isn’t the same as when we seek glorification. And God’s non-self-seeking nature is on display in how he extends the invitation for us to participate in his divine, eternal life, by completely ‘un-selfing’ — at the Cross. There is no Christian God apart from the God whose nature and love is on display at the Cross. God the father is ‘cross-shaped’ as much as God the son is crucified, as much as God the Spirit is — perhaps especially in his desire to completely throw light on Father and Son — cross-shaped. There is no self seeking part of who God is. Because we know God best as we meet him in Jesus, and we know Jesus best as we see him nailed to the cross. That’s what ‘glory’ looks like. Ulitmately, God is a story-teller. A creator. This is part of who he is. We know this because what we know most about God is that he creates and reveals (we know this from the world, and his word — and his ‘Word’ who the written word points to). He creates things that reflect who he is, and because of who he is that can’t really produce anything but glorification or contempt. The world God made is a finite thing made by an infinite thing to reveal something of the infinite. Things we make, and stories we tell, serve a similar function for us, they’re an outpouring of who we are in an attempt to make ourselves known (even to ourselves, if we never share them beyond ourself), an attempt to capture and reveal something of ourself in a moment in time. Jesus as ‘word’ and ‘image’ written into creation is the ultimate version of what God always does when he creates, a pointer to who he is. It’s also worth saying that an infinite, creative, mind could create an infinite number of possibilities, God didn’t have to make what he made. But he loves what he made so much that he wrote himself into creation, in a finite way that actually forever changed the nature of Jesus such that, even now, he is embodied in a glorious, resurrected body as a taste of the future work of re-creation God will do when we are resurrected to share in his next creative project, the New Creation, with him. 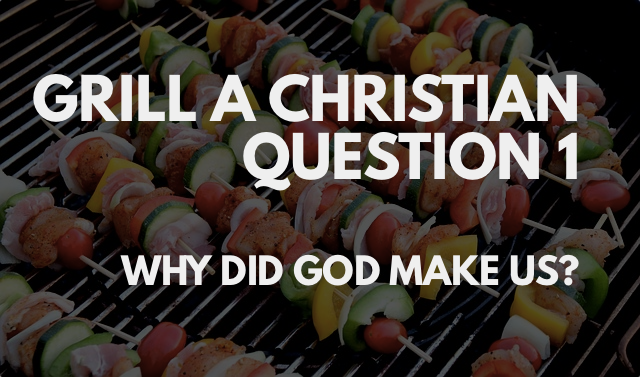 Grill a Christian: Where are God and Jesus? Grill a Christian: Question 2. How does heaven work?